The following will show you how to use tags on the Payment Rails dashboard. There are several ways to add tags, and they can be added to both Recipients and Payments. Whichever categories make sense for your business! You can add tags to recipients for better categorization. To do this, from the Recipients tab in the dashboard, search for the recipient you would like to tag. 1 - Recipient fly-out: Once you select a recipient, on the right side a pop out (fly-out) will display summary info of the recipient selected. Under the name there will be an option called "+ TAG". You can enter any word you would like to assign to the recipient and hit "Enter" on your keyboard. You can add multiple tags to the same recipient. 2 - Recipient Profile - The second place is on the recipient profile page. At the top of the profile under the recipients name click "+ TAG", and enter any tag word you would like and hit "Enter" on your keyboard. The tag will automatically save to the recipient, and will be visible next to their name in the recipient list. You can now filter recipients based on the tag attributed to their profile using the search box, which will allow you to potentially export to a CSV file these recipients (for reporting), or create batch payments to them, etc. Tagging is also available for payments. To add a tag to a payment, from the Payments tab, select the payment you would like to tag. 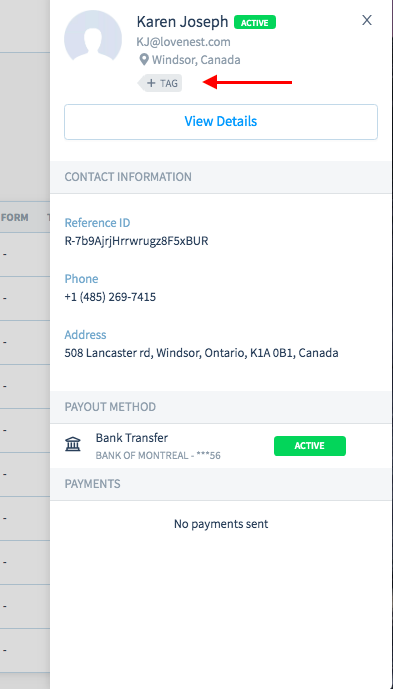 On the payment details fly-out on the right side (the pop out), there will be an option called "+ TAG". Here again, you can put in any word you desire and the tag will display next to the payment. You can add multiple tags to the same payment. 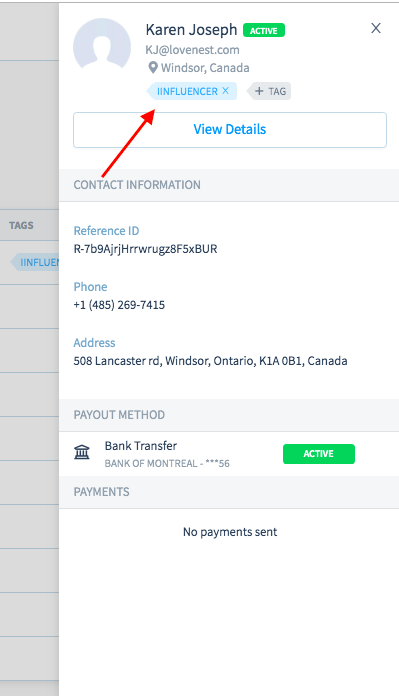 To Delete a Tag - simply hit the "X" next to the tag on the recipient profile page, or on the payment details fly-out window. The is no limit to the amount of tags you can add to a recipient or payment. Tags cannot be added to "Processed" payments. Recipients can not see tags, they are internal for your team only on the Dashboard. You cannot add the same tag more than once to the same recipient or payment.